"These little bites will be the prettiest things on the party table, and the first ones eaten!" Combine maple syrup, brown sugar, mustard, salt and cayenne in a non-stick skillet over medium-high heat. Add Lit'l Smokies smoked sausages and bring to a simmer. Heat, stirring occasionally, until sauce is reduced and almost gone, about 15 minutes. Sauce will be thick. 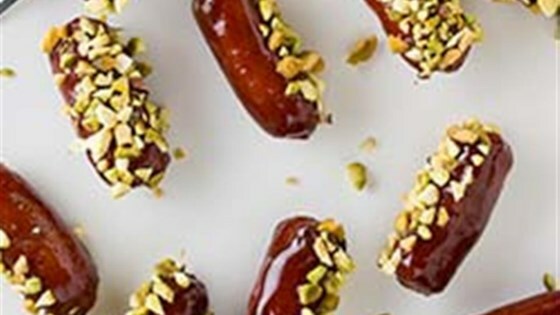 Remove smoked sausages on to a parchment-lined baking sheet and when cool enough to handle, dip in pistachios. Serve warm. These little bites will be the prettiest things on the party table. Increase cayenne to 1/2 teaspoon if you like it spicier. This is our favorite sausage recipe for entertaining now! The maple syrup and pistachios are a perfect combination and these disappear in an (appreciative!) frenzy.